Twelve Spartans took part in the Milton Keynes Festival of Running. 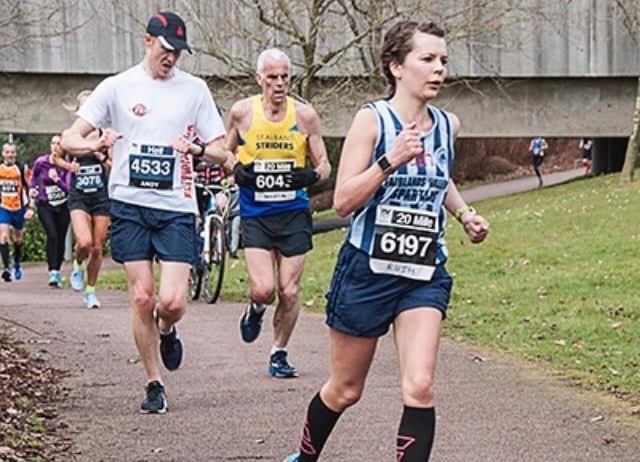 In the twenty miles event RUTH REILLY improved her personal best (PB) by an amazing 42 minutes when she finished in 2 hours 37 minutes 3 seconds. ERICA GRAYSON ran her first ever 20 miler in 3:11:37. As training starts to hit maximum mileages before the spring marathon season TOM SAUKA was fastest Spartan with 2 hours 27 minutes 40 minutes. BARRY KING also completed the 20 mile race option. He was very happy to finish in 3 hours 35 minutes and 10 seconds (chip time). This after being injured for the last two months with a bad back. He was just behind ROBERT WRIGHT, 3:35:51 but just ahead on start line to finish line time (chip time). VICKY COTTOM came in with 3:43:53. In the MK Half TODD GRAY ran a great sub 90 minutes 13.1 miles with 1:26:39 and a top 50 position of 47th. Five other Spartans ran the half. They were DAVE SMITH 1:37:59; TIM SABAN 1:45:52; JO BOWDERY 1:56:23; WENDY THARANI 2:00:33 and NICOLA KUKLYS 2:51:34. Last call for the coaches to the London Marathon on 22nd April 2018. Runners and spectators can travel there and back for just £10 but you must contact Roger Biggs on roger@thebiggs.net quickly. The runners’ bus leaves Stevenage Old Town at 6.30a.m. The helpers’ coach goes at 7.30. In a tactical contest for second, third and fourth GRANT RAMSAY won the SILVER medal in the British Masters 3000 metres Indoor Championship for men 45 plus in 9 minutes 55 seconds. Time of 9:55 not quick, but more of a tactical contest (between 2nd, 3rd & 4th). Marathon training affecting raw speed, but happy with overall result. Also in the 3000 metres 15 laps race for men but for those aged 55 plus DAVID BOWKER was eighth in 11 minutes 51 seconds. STEVE GREEN ran the Harpenden Half Marathon finishing seventeenth in 1 hour 32 minutes 29 seconds. A multi terrain, very twisty course that had cross country style muddy sections. Not a PB course but great informal fun. With Stevenage parkrun cancelled for this week, as a charity event took over the park, 17 Spartans ventured further afield to run on Saturday morning. Locally, NATALIE LAWRENCE, 1st female in a time of 22 mins and 40 secs, was joined by JAMES SOUTH, in a time of 31 mins and 21 secs, to make up the 140 runners in Letchworth. Three Spartans braved the rain at the Panshanger course, with MARK GOODWIN finishing in 23 mins and 35 secs, RUTH REILLY finishing as 4th female in 25 mins and 34 secs, and SIMON SYPULA finishing in 27 mins and 34 secs in his first run at this course. At Luton Wardown, LINDA GREENE finished in a time of 40 mins and 36 secs. Seventh male and female rankings fell to SIMON and ANNETTE BELL, both achieving their fastest times of 2018 in 19 mins and 6 secs and 24 mins and 17 secs respectively, in Peterborough. ANDY JAY was the 6th male and 8th overall, in a time of 25 mins and 22 secs at the Westmill course, while Cassiobury, Barclay and Rutland Water saw top 20 finishes for TIM SABAN (20 mins and 36 secs), ASHLEY SCHOENWETTER (22 mins and 37 secs; 2nd female), and VERITY FISHER (27 mins and 5 secs). With improvements from the last time out saw JOHN ROXBOROUGH finish Cambridge parkrun in 23 mins and 4 secs, DANIEL SUTTON finish the Torbay Velopark course in 27 mins 23 secs, MICHAEL O’KEEFE run 28 mins and 15 secs at Houghton Hall, and TRACEY STILES complete the Ellenbrook Fields run in 33 mins and 36 secs. Returning to the Brockenhurst course for the first time since January DARRYL STEVENS finished in 48 mins and 48 secs. Club Run Finale in Stevenage on Thursday 15th March.